The first time I liked eggplant was in London. Until then, I was one of the many eggplant haters. The flesh too bitter, too slimy. The skin too rubbery. My mouth too itchy with each bite. Babaghanoush? No thank you. Eggplant parm? Nope, I make it with zucchini. Ratatouille? I’ll pass. And then, sitting in the Japanese restaurant a block from her flat, Lau ordered the aubergine that changed my hating ways. Lau and I worked at the same company, me in New York, her in London. We first met when she was on secondment to our New York office, and I lived a dozen blocks uptown from her, and after late nights in the office, we used to share a taxi home. Around the time she returned to the UK, I started working with a client in Germany. I’d bookend every trip with a few days in London. You know, to make sure I wasn’t jetlagged for client meetings. Once my project was over, I took advantage of our cross-Atlantic company and worked out of our UK office every few months. I’d stay on Lau’s orange pull-out couch. Each time I visited, there was more framed art on the wall. They were mostly Lau’s paintings. And there was that five-foot piece she’d managed to get past security and onto a plane as her carry-on. We made good roommates. I’d stock her fridge with groceries and make dinner with her limited appliances. (She had no oven. For real. No oven. I had my work cut out for me.) She’d order in sushi from the place down the street. The same place every time. We’d eat on our laps on that orange couch. After dinner, Lau would make a pot of milky tea. And then usually we’d have to pull out our laptops and work. For a few years, I thought that the sushi place was take-out/delivery only. When we walked past it on the way to the tube every morning, I never noticed that there were seats inside. One night, with bags slung over our shoulders, we walked in. The little sushi place was long and narrow, at least twenty tables between the street and the kitchen hidden away behind a red and black curtain. We ordered more sushi than two people should ever eat in one sitting. Those paper lists with the check boxes and the little nubby pencil, they get me every time. Just as the waiter was about to turn away, long list triumphantly in hand, Lau gestured him back. “Oh, and can we have the aubergine?” He nodded. I looked at Lau head tilted, brows furrowed. “You’ll love it, trust me.” And that was that. The waiter set on our table two golden sticky eggplant halves, mirror images of each other. Lau scooped out the flesh and took a bite. I scooped out the flesh and took a sniff. Sweet, and a little smoky. I raised fork to mouth and took a nibble. Sweet, salty, smooth, silky. Several scoops later, there was only thin crispy skin left. And there there was just a plate with a few golden brown sticky pools where eggplant had sat just a few minutes earlier. I turned into an eggplant lover. I’ve never turned back. 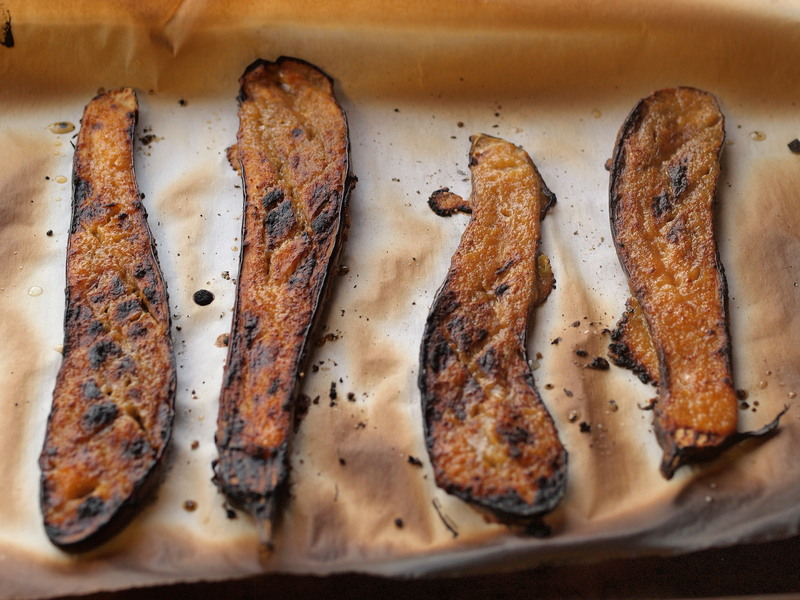 I have dreamed about this caramelized salty sweet miso-glazed eggplant since the day I had it years ago, and after a few tries, I got the recipe right. I used the eggplant roasting technique from Ottolenghi’s Plenty and the miso glaze recipe from Deborah Madison’s Vegetable Literacy. Make sure to cross hatch the flesh so the eggplant cooks quickly and evenly, and the glaze seeps into the flesh during the second roasting. You’ll have some extra sauce which would be great on roasted vegetables or with tofu. I’ve been able to find miso in Whole Foods and health food stores. Serves 2 as a side dish or starter. Prep. Preheat the oven to 400ºF. Put one rack in the middle of the oven and another just under the broiler. Line a baking sheet with parchment or aluminum foil. Cut. 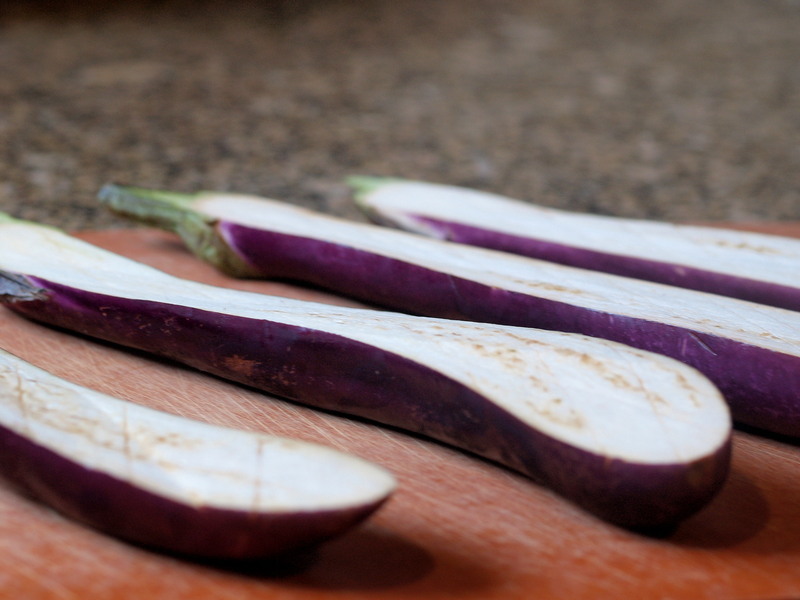 Slice the eggplants in half lengthwise through the green stalk. Use a small sharp knife to cross-hatch the flesh without cutting through the skin. Roast. 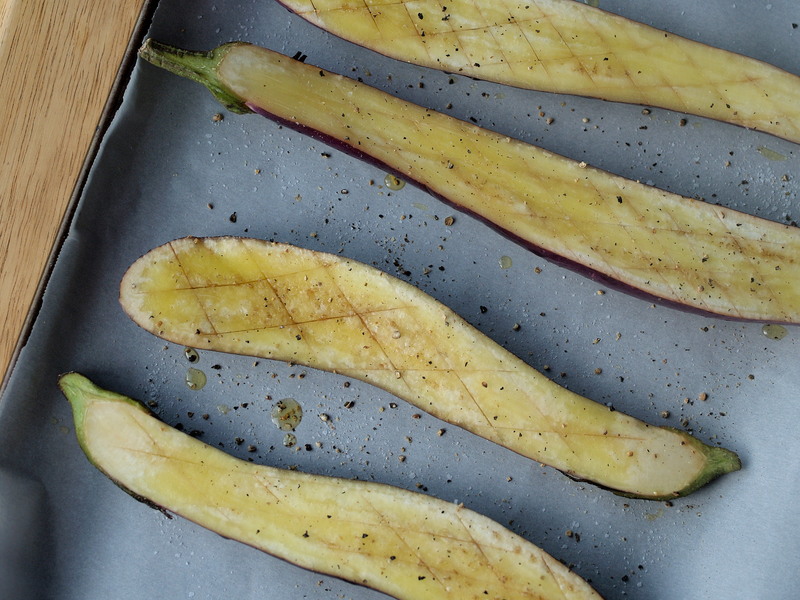 Arrange the eggplant halves, cut side up, on the lined baking sheet. Mix the olive oil and 1 tablespoon of sesame oil in a small bowl. 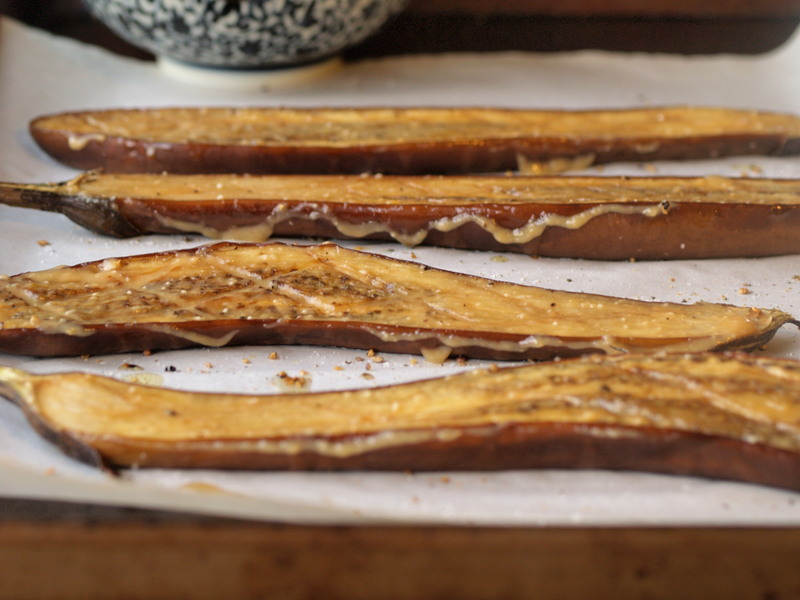 Brush the eggplant flesh with the oil mixture, and keep brushing until all of the oil has been absorbed. Sprinkle with salt and pepper. Go light on the salt because the miso is pretty salty itself. 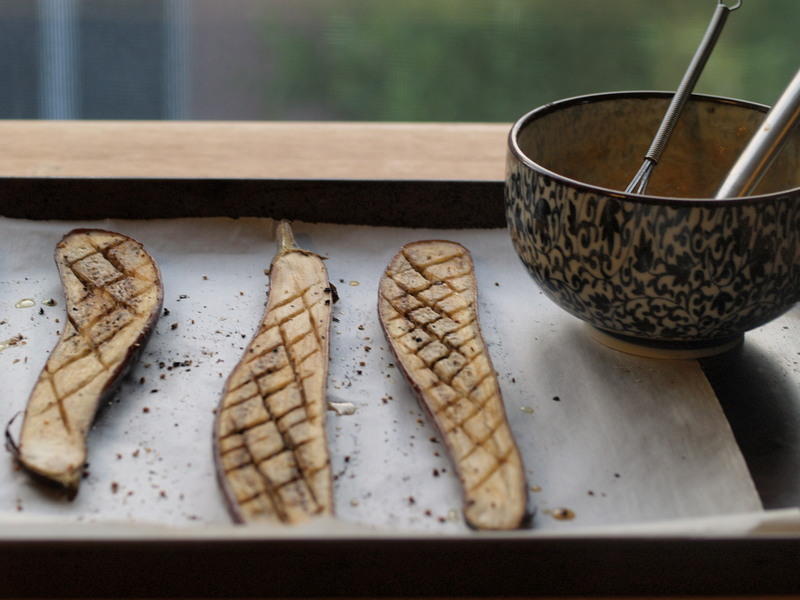 Roast the eggplant for about 20 minutes. They’re ready when they start to brown and the softened flesh pulls away from the cross-hatch cuts. Whisk. 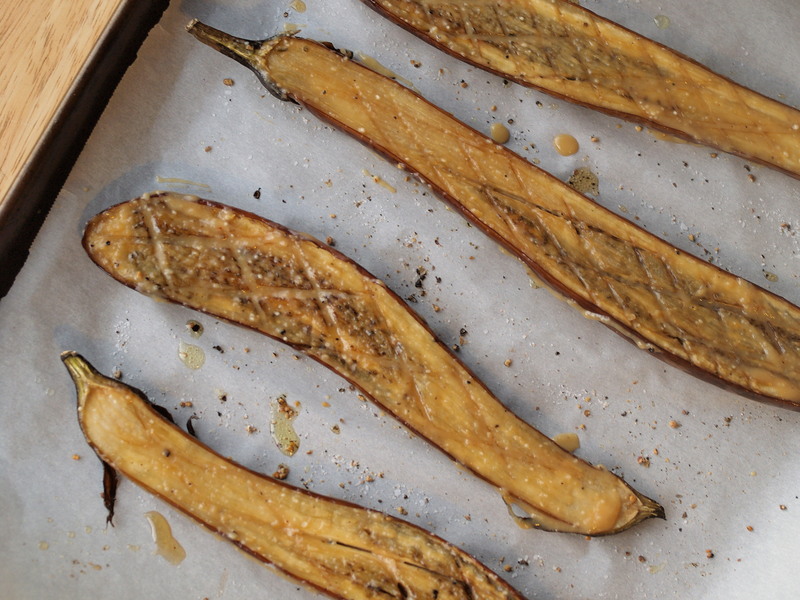 While the eggplant is roasting, whisk the miso, mirin, and sugar into a paste. Stir in enough warm water (I needed 3 tablespoons) to thin the mix to a smooth consistency. Slice and toast. Thinly slice the green onions on a bias. Spill the sesame seeds into a small pan over medium-high heat. Shake the pan occasionally and remove from the burner when the seeds are golden brown and smell nutty (about 5 minutes). Watch closely so that the sesame seeds don’t burn. Broil. Remove the eggplant and brush with the miso glaze. Turn on the broiler. Place the eggplant on the top rack and watch carefully. Within about a minute, the glaze will start to bubble and caramelize. Remove from the oven and let cool for a few minutes before eating. Serve. 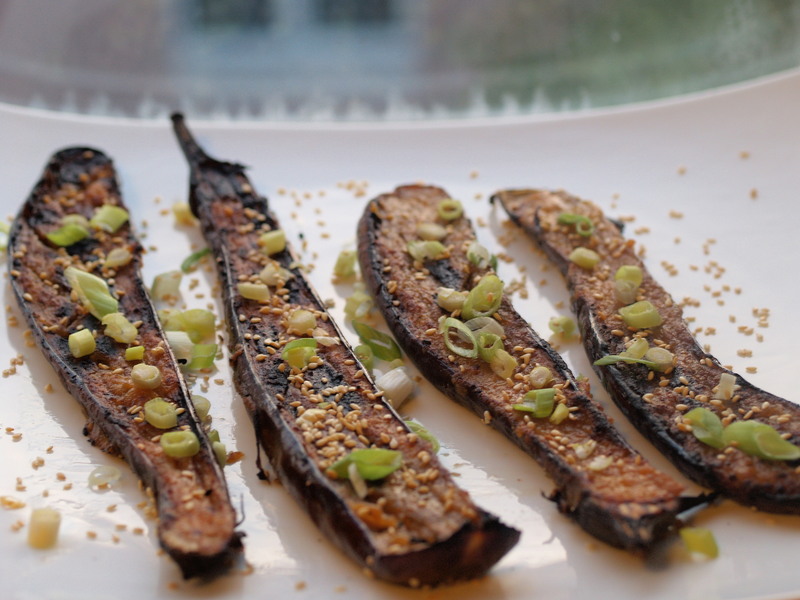 Sprinkle the eggplant with the green onion and toasted sesame seeds.